Adolescent girls are often subjected to harmful traditional practices, such as female genital mutilation, gender-based violence and child marriage. These practices not only threaten their health and livelihood, but also compromise the well-being and opportunities of the next generation. To educate communities about the risk and health implications associated with harmful traditional practices (HTPs), we have partnered with two local organisations: Association for Women's Sanctuary and Development (AWSAD) and the Afar Pastoralist Development Association (APDA). The Association for Women's Sanctuary and Development (AWSAD) provides a holistic service for women and child survivors of gender-based violence. This service includes temporary shelter, meals, counselling, medical care, legal support, and basic literacy and skills training. Empowerment sessions on gender, reproductive health, and life-skill training are provided for survivors living in the safe house. These are designed to help develop the women’s self-esteem. Through the legal follow-up service, survivors are able to track and finalise their cases, often resulting in conviction of the perpetrators. Thanks to our donors’ support, AWSAD have been able to help a number of girls with their education costs. They also provide them with a support package: school registration fees, educational materials (such as textbooks, exercise books, pens, pencils, and uniforms), and safe transport to and from school. Survivors of violence were able to rehabilitate from their traumatic experiences through the safe house services. The empowerment sessions gave survivors knowledge about their rights and developed their self confidence. Young survivors have been able to continue their education and successfully transfer to the next level of their education. There have been 23.8 million victims of FGM in Ethiopia, making it the second highest country in Africa by affected numbers. In regions such as Afar and Somali, the rate of FGM is as high as 87%. FGM is just one of many outdated, brutal and dangerous practices that affect women in Ethiopia. The Afar Pastoralist Development Association (APDA) is our trusted partner working to eradicate female genital mutilation (FGM) in the Afar region of Ethiopia. In 2016, APDA were able to overcome a series of challenges to provide their care. Working in the most severely affected drought region in Ethiopia, APDA’s women extension workers gave the community the capacity to cope with these difficulties, including drought, flooding, and disease outbreak. These workers also continued their efforts to raise awareness and encourage clan leaders to stop harmful practices. They engaged local level religious leaders and witnessed productive conversations regarding the dangers of cutting and the benefits of educating and training women. A community radio station has helped deliver important messages regarding FGM as well as early marriage. Despite these vital changes, there is still more work to do. 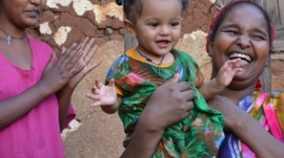 They also work to persuade FGM practitioners to publicly reject the practice and undertake new professions, and train traditional birth attendants to actively discourage FGM, counsel expectant mothers, and conduct post-natal check-ups. APDA also seeks to educate families on the multiple health issues faces women and girls. The practice of Mingi – the ritualistic killing of infants and children believed to be ‘cursed’ – occurs in the remote Omo Valley region of southwest Ethiopia. Our partner Omo Child works to provide a safe environment for rescued Mingi children, giving them a safe home and quality education. Living at the Omo Child home may be the last option for these rescued children, as they have been excluded from their village. The children are loved for and looked after by ‘mamas’, nannies and other caretakers, who provide them with food, clothes, and necessary medical care. In 2016, the Association for Women's Sanctuary and Development was able to reach over 423 women and girl survivors and their children through the safe house services. The Association for Women's Sanctuary and Development have helped 19 girls, studying across primary, secondary, and higher education, with their education costs. Two students were able to graduate from university and get employment thanks to the efforts of the safe house. Delivering training in four primary schools has raised awareness and understanding of gender-based violence. In 2016, 50,000 women were made aware of the risks of female genital mutilation. Over 4,500 women attended weekend tutorials, educating them about their rights and the dangers of female genital mutilation. The number of female extension workers has now increased to thirty, meaning an even wider area can be reached and the scope of the programme can be improved. Omo Child has been able to care for 47 children at the home, providing 24/7 care from their incredible nannies, who work on 24 hour shifts so that each child is given the attention they deserve.